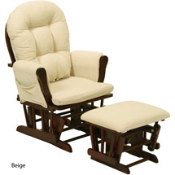 Our bowback glider and ottoman are made of solid wood with very soft, luxurious feeling pads. Sure to become the center of operations, once baby enters the scene. Includes side pockets for storage. Colors and styles may vary.